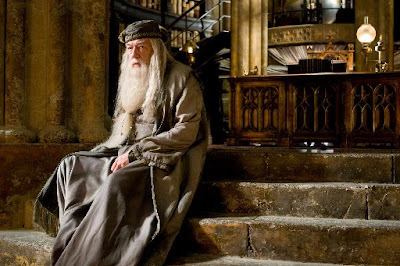 Revisiting the “Half-Blood Prince”: Is Elvis in the building? — It must be something about all that proper English pronunciation, but I could have sworn that at least two characters addressed Albus Dumbledore as “Elvis.” This may have been wishful thinking, just because “Elvis Dumbledore” would be the coolest name ever. — I hate to pick on a teenager, but unfortunately Bonnie Wright’s lackluster performance as Ginny Weasley is the weak link in the film. It’s a reminder of how lucky the producers were in their main characters — when you cast a child of 9 or 10 for a recurring role, you don’t really know if/how he or she will grow as an actor. Wright is a lovely girl but an inexpressive presence, particularly compared to Emma Watson (whose development as an actor over the last eight years has been remarkable) and to the sparkling, brief supporting performances by Evanna Lynch (Luna Lovegood), Jessie Cave (Lavender Brown) and Anna Shaffer (Romilda Vane). The filmmakers seem aware of the problem: Ginny’s role has been strangely minimized, and one key emotional scene (when Ginny comforts a weeping Harry near the end) is carefully arranged so that we don’t see Wright’s face. — Anybody else notice how very old Draco Malfoy is suddenly looking? Tom Felton, the actor, is only 21, so it’s a makeup/camera trick, and is quite haunting — he seems suddenly to be carrying the weight of many years. — Helena Bonham Carter is truly awesome. That is all.